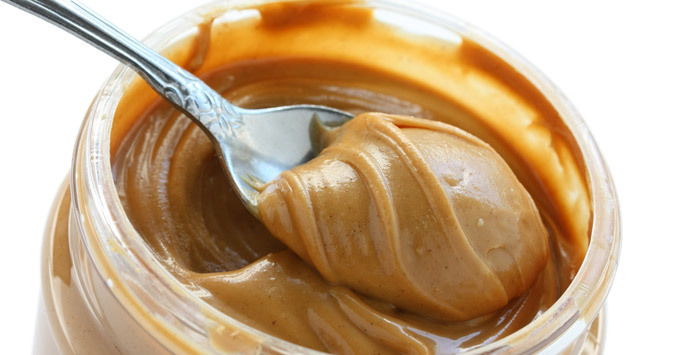 If you are among the many runners who tries to stay away from peanut butter because it is fattening or too fatty, think again and keep reading (as long as you are not allergic to peanuts, that is). The purpose of this article is to educate you about the value of PB in the diet of runners of ages and athletic abilities (as well as their parents and grandparents). • PB offers many health benefits. The fat in PB is primarily health-promoting mono- and poly- unsaturated fat that knocks down inflammation. People who eat PB and nuts five or more times a week have lower markers of inflammation than nut avoiders. For runners who get micro-injuries every time they train, an anti-inflammatory food such as PB is a wise choice. • Compared to nut-avoiders, unhealthy women (with type 2 diabetes) who ate 1.5 oz. (250 calories) of peanuts (and/or nuts) five or more times a week reduced their risk of heart disease by 44% and the risk of having a heart attack by 60% (2). Routinely swapping a burger for a simple to make PB sandwich is a heart-healthy choice. * If you are training hard repeated days in a row, you’ll optimize your sports diet by eating at least 0.5 grams fat per pound of body weight. The body stores some fat within muscle cells and uses it for fuel during extended exercise. PB in oatmeal before a long training session or a PB & J sandwich to refuel afterwards are yummy and healthy ways to enjoy adequate dietary fat. Fat-phobic runners (who avoid fat) can hinder their endurance. • Peanuts offer slightly more protein than nuts. That’s because peanuts are a legume (like lentils and dried beans) and not a nut. One serving (2 tablespoons) of PB has 8 grams of protein, while 2 tablespoons of almond butter has 6 grams (at a much higher price!) Runners want to target at least 20 grams of protein per meal or snack. You can get that by swirling PB into oatmeal cooked in (soy) milk, enjoying a PB & honey sandwich with a yogurt, or making a PB-banana smoothie. Quick, easy, and inexpensive. • All peanuts are non-GMO and have low risk of pesticide residue, in part because peanuts grow under the ground. • What about all the sugar added to Skippy and Jiff PB? “All that sugar” is only 2 or 3 grams. That’s nothing compared to the 10 to 15 grams of sugar in the jelly or honey you might enjoy with the PB, or the 6 g sugar in the sandwich bread. Regardless, sugar fuels your muscles. Please fret less about added sugar and focus more on PB’s zinc, folate, vitamin E, niacin, and selenium. It is nutrient-rich. • What about all the sodium in PB? The 150 milligrams of sodium in a serving of PB is less than the sodium you get in a slice of bread or 12-ounces of Gatorade. Regardless, as an athlete, you want to replace the sodium you lose in sweat. • But what if I can’t eat just one spoonful…? If you stay away from PB because you can’t eat just a reasonable serving, think again. Overindulging in PB means you like it; you should eat it more often! By enjoying PB at every meal, in a few days, you will stop craving it. No more binges! Avoiding peanut butter just sets you up for “last chance eating.” You know, I just blew my diet by eating PB so I’d better keep eating it. Last chance before I go back on my diet. Denial and deprivation of PB lead to overeating. Do not deny yourself of this yummy sports food. You will deprive your body of valuable health benefits! Sports nutritionist Nancy Clark MS RD CSSD has a private practice in the Boston-area (Newton; 617-795-1875), where she helps both fitness exercisers and competitive athletes create winning food plans. Her best-selling Sports Nutrition Guidebook, and Food Guide for Soccer are available at www.nancyclarkrd.com. For workshops, see www.NutritionSportsExerciseCEUs.com.